Governor Ralph Northam lifted the mandatory evacuation of residents in Zone A of Hampton Roads, the Eastern Shore, Northern Neck and Middle Peninsula at 11 a.m. following the National Weather Service lifting the tropical storm warning for coastal Virginia. NORFOLK, Va. (WVEC) — A mandatory evacuation that had been in place for Hampton Roads residents living in Zone A was lifted on Friday morning, Gov. Ralph Northam announced. The lifting of the evacuation order comes as the National Weather Service removed a tropical storm warning for coastal Virginia. Northam issued the evacuation order on Monday for anyone living in low-lying areas that had been designated Zone A. The order affected approximately 245,000 people. “The imminent threat of coastal flooding and high winds have passed for our coastal communities as Hurricane Florence has made landfall in the Carolinas and we believe it is safe for Virginians to begin returning home,” Governor Northam said in a press release. Northam's office said individual localities will coordinate the return of their citizens with consideration to flooding and road conditions, public health and medical concerns, public safety issues, ongoing response activities, and critical utility restoration. Residents should check local government websites and social media channels for any additional instructions. People should also use caution when returning home, and check road conditions before traveling by logging on to www.511Virginia.org or call 511. 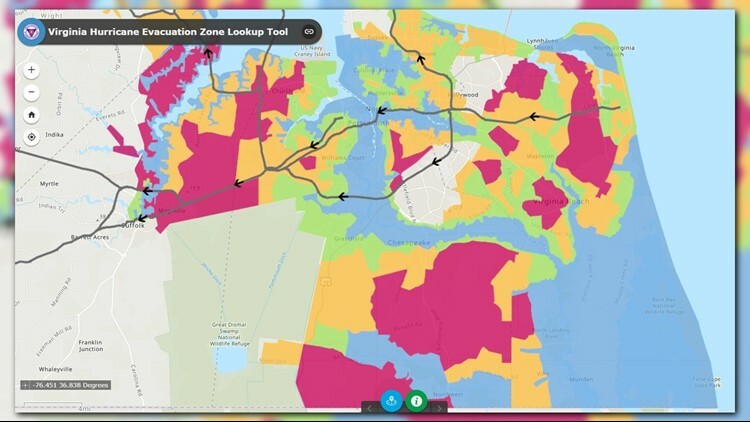 There are four hurricane evacuation zones in Virginia, with Zone A being the most at-risk and Zone D the least at-risk.